This Sunday in worship we celebrate Jesus’ triumphal entry into Jerusalem. It’s a grand parody of victorious procession—a conquering royal hero vanquishing foes. Except no ruler by fear, this is the Prince of Peace. His ministry approaches culmination. His impact reaches contentious climax. His life will come to an end. We understand events of Holy Week, especially Jesus’ death on the cross, most faithfully in relation to everything that comes before and after. Why his way lead to the cross. Why authorities of Rome and religion wanted to kill him. How, in the power of God’s love, that wasn’t the end of the story, as his presence and ministry continues through us even today. Swirling around all the hopeful celebration of Palm Sunday is conflict and contention. That spirit also plagued the earliest followers of Jesus Christ. And so, it also continues over the centuries through us even today. It seems a never-ending challenge of the human condition. Here’s one example. Every week seems to bring new reports about intentional use (if not manipulative abuse) of social media to affect the last election cycle. There is much recrimination. There is heightened concern about our next election. Appropriate measures to resist infiltration, protect privacy, and safeguard our democracy should be taken. Whatever that means relative to foreign companies and countries, it also includes our own culpability for the way we engage one another. A serious problem plaguing current American society is a lack of real relationship with one another. The sad and simple fact of social media manipulation is that it preyed upon, sowed tendencies and exacerbated realities already present within us. Again, we should respond to harmful foreign influence. And we need to heal the illness of society beginning with our own heart disease that arrests relationships, including people of every partisan persuasion. 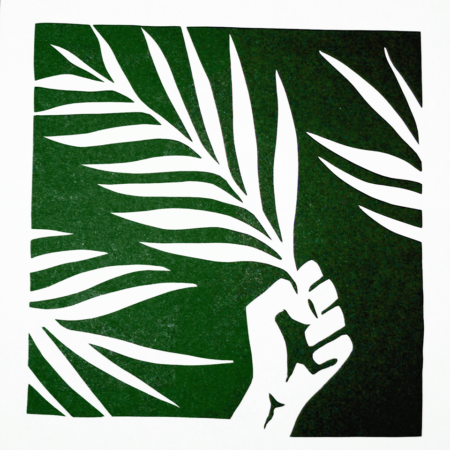 Palm Sunday is all about “speaking truth to power”. As the parade continues in our time, we need to speak up and act out pursuing the way God wants to order our world with Holy Love—against prejudice, violence, crippling poverty, institutionalized inequity, and everything else that takes life more than giving it. This faithfulness is often political—in the truest sense, that is, relational as we try to nurture goodness and build up abundant life in community. We can be political without descending into bitter partisanship. We need to be. And in this way, too, Jesus can be our helpful guide—the pioneer and perfecter of our faithfulness. Let’s return again to Palm Sunday. Yes, Jesus knows it’s provocative. The way Mark tells the story, Jesus plans details carefully. And he’s effective (crowds follow him and line his way), precisely because of all the ways he’s related intimately and lovingly for years with people of every category and condition. For Jesus, the political arises out of the personal. As we try to speak truth to power and engage issues of our time, let the same mind by in us that was in Christ Jesus (Philippians 2:5). Ironically perhaps those of us who lament attacks that divide us in church and society, feel inclined toward avoiding conflict, and want church to be a sanctuary of loving relationship have it right. Paul urges the ancient church in Philippi and all of us: Whatever is true, honorable, just, pure, pleasing, commendable, and worthy of praise, center your hearts and minds on these things and God of peace will be with you. And the Prince of Peace will enter again into our hearts and reign in our community as in the Holy City long ago. God’s grand parade in Christ continues.